Clinical Naturopathy: an evidence-based guide to practice, 2nd edition, by Jerome Sarris and Jon Wardle, articulates evidence-based clinical practice. It details the principles, treatment protocols and interventions at the forefront of naturopathic practice in the 21st century. 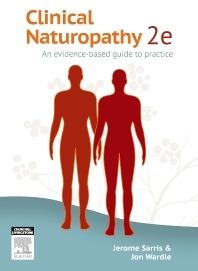 Clinical Naturopathy 2e: an evidence-based guide to practice, equips you to critically evaluate your patients, analyse treatment protocols, and provide evidence-based prescriptions. This second edition promotes the fundamentals of traditional naturopathy, while pushing the scientific boundaries and driving the steady evolution of the profession of naturopathic medicine. • A rigorously researched update of common clinical conditions and their naturopathic treatment according to evidence-based guidelines (over 5,000 references). • Bridges conventional medical and naturopathic paradigms to help clinicians facilitate truly integrative models of care. • Augmented appendices including: herb/drug interaction charts, laboratory reference values, food sources of nutrients, cancer medication interactions and nutraceutical use. • Key Treatment Protocols throughout the text offer an evidence-based referenced critique. • Naturopathic Treatment trees for each condition, with Treatment Aims boxes that are easy to follow and understand. • Scientific and traditional evidence validating treatment protocols. • Decision trees, unique figures, tables and charts are a great aid to visual learners.